Home / Adventure Travel & Culture Blog / Wildlife spotting in the Iberá wetlands, Argentina. Black caiman, capybara, howler monkeys and rheas are just some of the species you might come across in the Iberá wetlands, the second largest wetland in the world. Covering an area of over 6,500 square miles in north-east Argentina, the wetlands are a collection of lakes, bogs, swamps and rivers and are an important site for wildlife conservation. In 2009 the Iberá Provincial Park was created on Public land in the wetlands covering an area of 482,000 hectares with well established boundaries and park rangers. In addition there are 750,00 hectares of private land know as the Iberá Provincial Reserve dedicated to minimising the environmental impact of their activities. There are plans to convert the area into a National Park in the area. There is a wide range of wildlife which can be spotted. these include black caiman, capybara, marsh deer, rhea, howler monkeys, foxes, armadillos and giant lizards. For bird watchers, as well as herons, cormorants, king fishers and Ibis the lucky ones might spot a Jabiru stork, a black-and-white monjita, a southern screamer or even a strange-tailed tyrant. The Ibera project is also aiming to reintroduce species that have been eliminated form the area such as the jaguar, the giant otter, the giant anteater, the collared peccary and the south american tapir. The airport at Posadas in Argentina, a 2 hour flight from Buenos Aires, is the gateway to the wetlands. The Irupe Lodge is a 4 hour drive from Posadas Airport and is located the small town of Carlos Pellegrini on the edge of the central wetlands. The drive can be a little bumpy towards the end but the rewards are great, particularly with the quantity of wildlife. Programmes are usually 4 days and 3 nights and include transfers, a jungle hike in search of howler monkeys as well a boat excursions in the wetlands spotting black caiman, cabybaras and more. All meals and non alcoholic drinks are also included. Tom Shearman after his visit to the Irupe Lodge said “Ibera is a hard place to get to, and a hard place to leave, yet its laidback lodge and people, and even the wildlife, lend it a magical attraction. Only a 40 minute drive is Hotel Puerto Valle located on the shore of the Parana River and on the north-east border of the wetlands. The hotel has a total of 13 very comfortable rooms, 8 of which are deluxe rooms divided in 4 bungalows and ideal for families. Activities here also include a howler monkey trail, boat excursions on the wetlands and Parana river as well as Kayaking, horse riding and the use of mountain bikes. There is also the option to visit the nearby town of Ituzaingó and its museum detailing the local history and Guarani culture or a visit to the mate tea plantation at Las Marias. Programmes go from 3 days/2 nights which include transfers, excursions and all meals. Drinks are extra. Special programmes can be put together for families. This is an all year round destination but the best time to go is from late June to mid November as the day time temperatures are not as high as in the rest of the year. 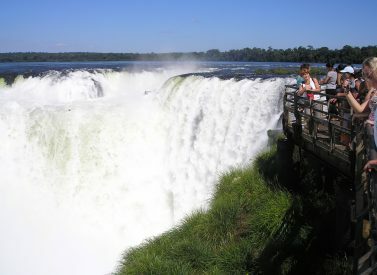 Ibera can be combined with visits to the Iguazu falls, a 5 hour drive from Puerto Valle including a stop to visit the Jesuit ruins of San Ignacio. Contact us if you are interested in going to visit the Iberá wetlands or would like more information.